For this coming Halloween party I wanted to add some funny-shaped parcels to our decorations, you know, the kind that are wrapped in brown paper with strings round them, with old fashioned and/or wizardy labels attached, dropped off in a corner as if you hadn’t had the time to put your shopping away before company arrived. Everything I used was craft materials or things to be recycled that I already had at home. I wanted the parcels to be really light, both for storage purposes and the fact that it will make it lots easier to make them “levitate” or so, should I want that sometime. 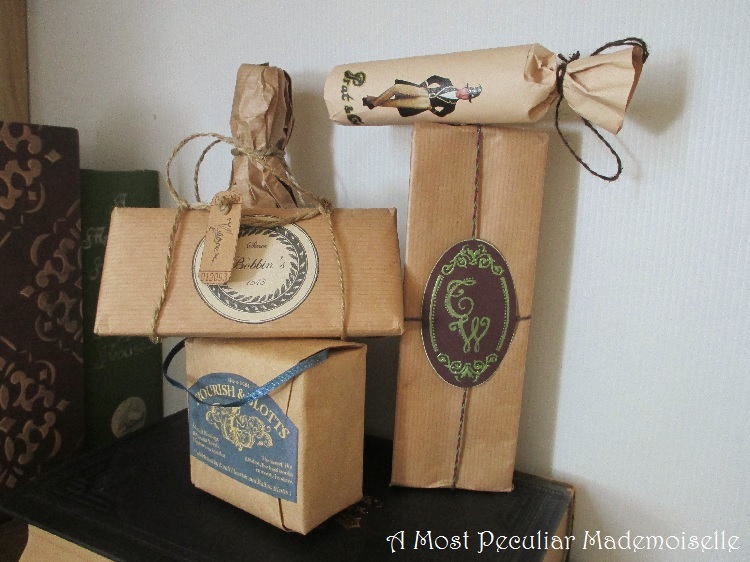 I used a variety of re-purposed cartons and empty cardboard tubes, and wherever needed I cut them to shape, added bottoms or tops, and stuffed them with crumpled up newspaper so they wouldn’t collapse under lighter pressure. 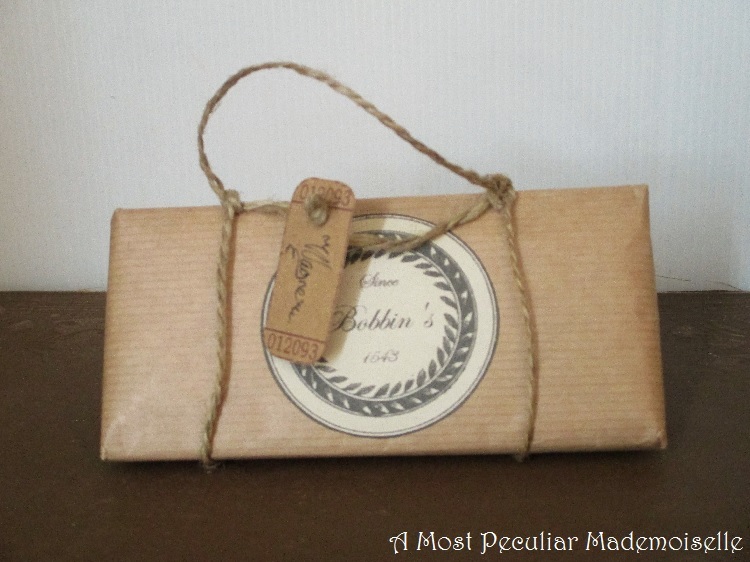 For wrapping I picked brown paper in different shades and textures, to make it more organic and realistic, and I avoided using ordinary tape wherever it might show on the outside. I thought it more likely that grown wizards would use magic to wrap parcels, and a light Sticking Charm to hold them together. Sure there is supposed to be Spellotape available, but what adult and reasonably competent witch or wizard would bother with that when there’s an alternative? 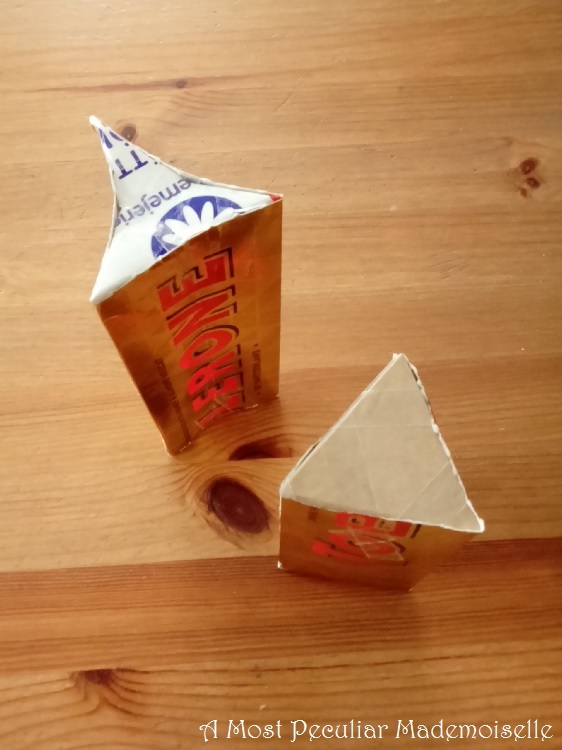 For two of the parcels I used a large Toblerone carton cut in half as base. I closed the ends with taped on “lids” made from milk carton. One of the halves was stuffed full of newspaper so it looked quite fat, the other one I folded and shaped to look decidedly more skinny, made “lids” to emphasise the shape and only put a tiny bit of newspaper in the middle. 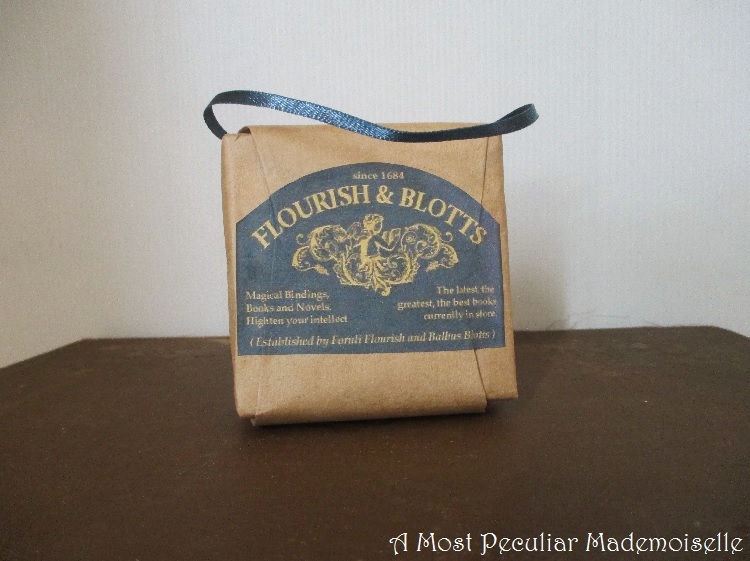 One of them got a label I also used for some of the potion’s ingredients I made last year, based on a chain of apothecaries mentioned in The Half Blood Prince. I also added a tag with a serial number and wrote our last name on it, as if I had went in to order something, and came back later to pick up my purchase, ready packed. For the other I made a string from green and purple linen thread, and glued on a label in the same colours. The label was all purple to start with, with an embossed pattern. I just filled this in with glittery green pen, and added a couple of letters. I then cut out a piece of green cardstock slightly larger than the purple in size so it made a narrow frame, and glued them together with the string in between. 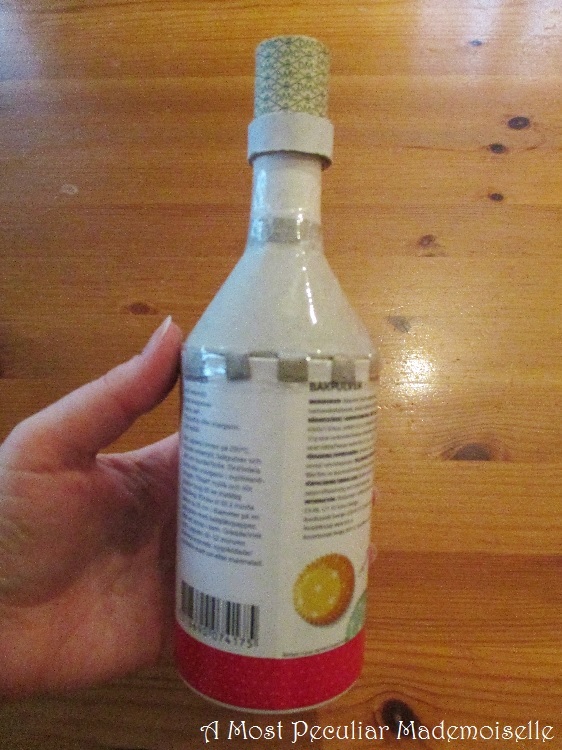 For the bottle shaped parcel I used an assortment of cardboard tubes that previously held plastic foil and other kitchen items (I always save cardboard tubes, and they always prove useful), an empty cardboard baking powder jar, a short cardboard tube that used to hold crochet thread and a piece of carton, and made a crude bottle shape from them. 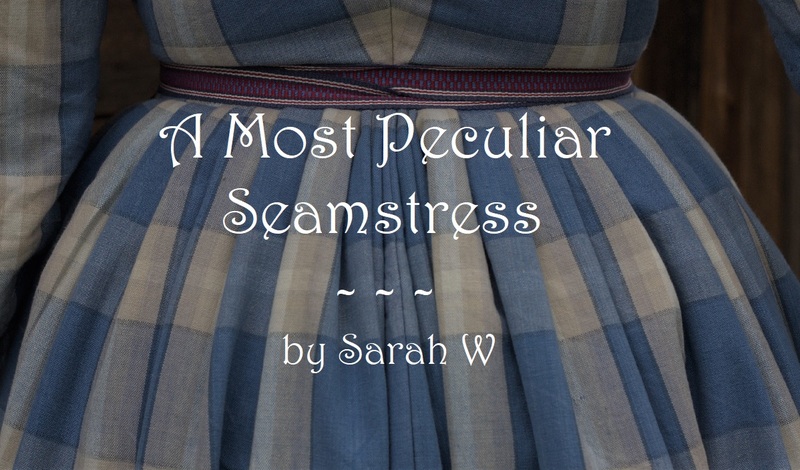 It didn’t look too pretty as was, but that didn’t bother me, as no one would see it when wrapped anyway. Once that was done and a string tied round it, the would-be bottle looked really realistic. 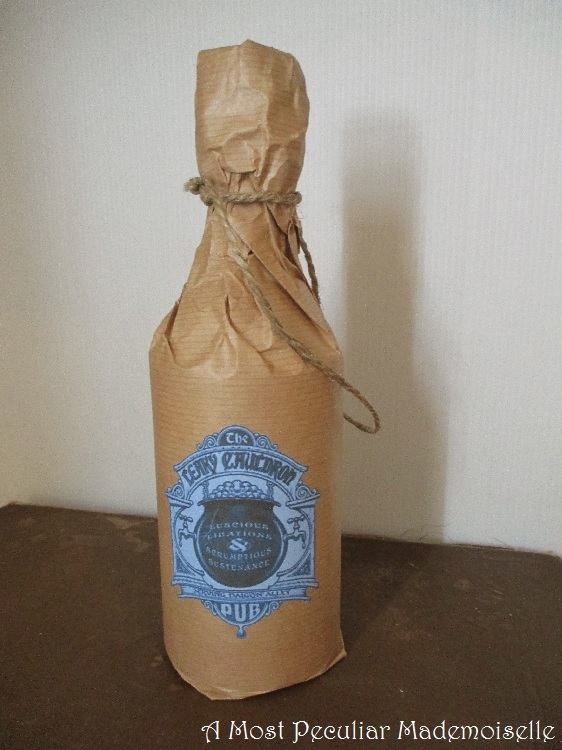 I added a label from The Leaky Cauldron – they have lovely non-alcoholic beverages there as well, at least that’s my story and I’m sticking to it. I found the label on-line. This one was just an empty toilet roll that I cut open and rolled tighter to make it less obviously toilet roll-y. 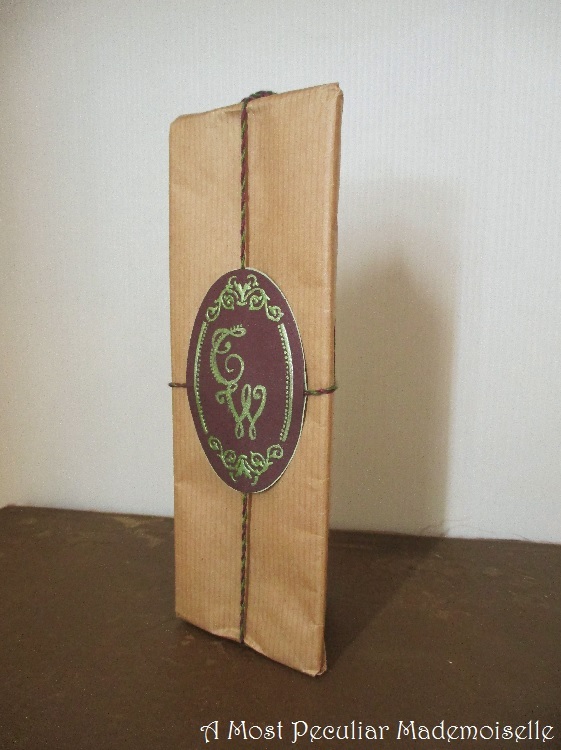 I wrapped it in tea dyed printing paper – I have several tea dyed papers ready to be used for different projects. I found a picture of a weird looking chap in Ca 1830s clothes that I cut out of a magazine years ago when that was my main source of images (meanwhile, I love the treasure trove that is found on the internet), and by cutting down his top hat to be a pointy wizard’s hat, and adding gold accents to the hat and coat, he looked…. Well, he looked a bit like a prat. 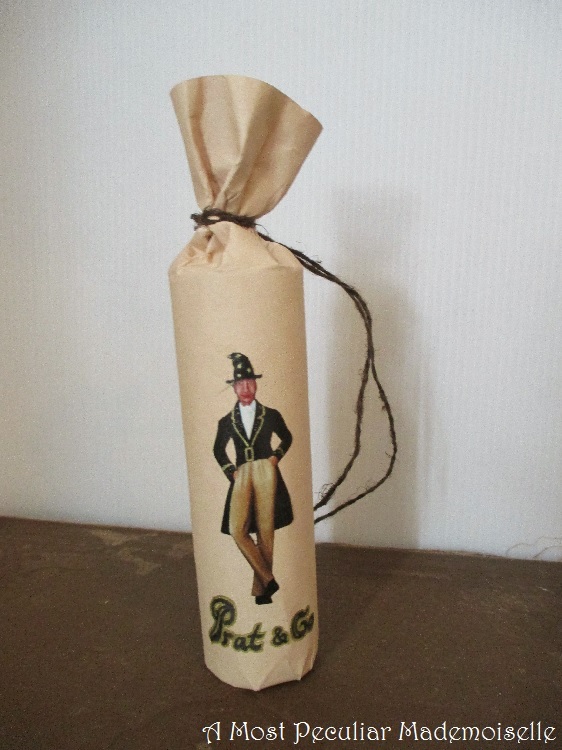 A wizard prat, but a prat nonetheless, so Prat & Co became the name of the shop. I giggled over that a bit. I made a string for carrying out of some dark brown, really unevenly spun linen thread I was given once. Here I used a cut down milk carton for the base, and it was sturdy enough to hold up without the help of crumbled up newspaper. I added a label I got of the Internet, and a narrow satin ribbon (it matched the label nicely and I had just enough of it to work) for carrying. In a family like ours, of course you’d have purchased something at a bookshop. I’m not quite sure what’s supposed to be in all of the parcels, but they do look nice, I think. Put in a wobbly, lopsided pile I think they’ll make a great decoration for our wizarding party. But I might need some more parcels, bigger or square ones to form a more solid base for that to work really well. These will look good as accents. 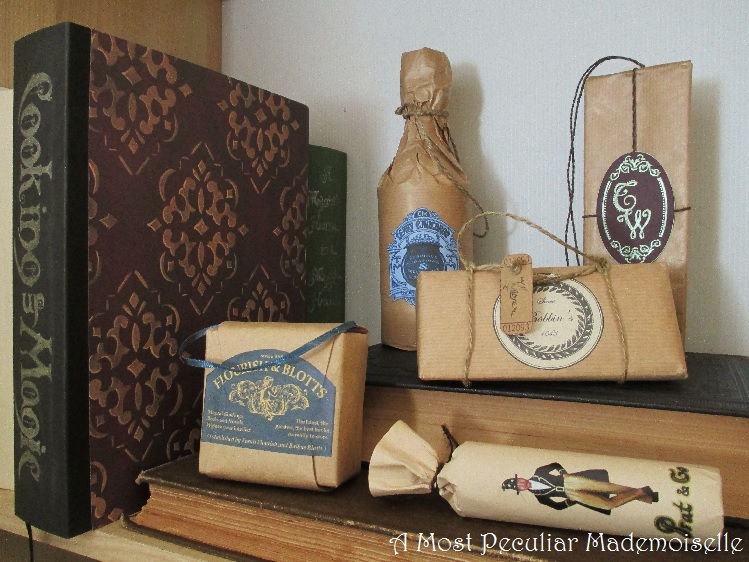 With different labels, parcels like these might also make nice Christmas decorations. What do you think about them? These are so fun! They look simultaneously historical and magical. Perfect party decorations!